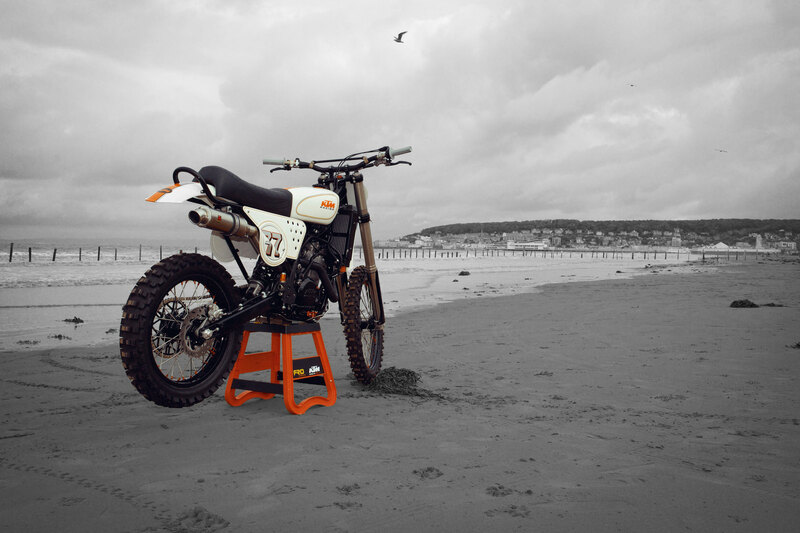 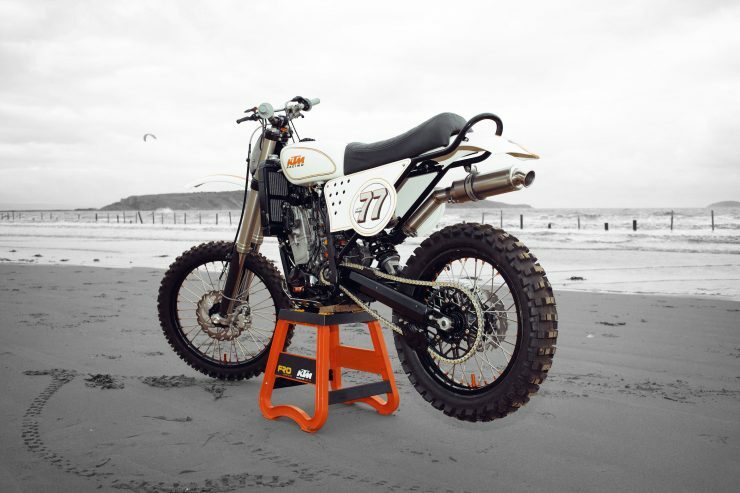 When people set out to build their first custom motorcycle, it very rarely goes as well as it did with this KTM. It’s the work of former British Top 10 Motocross racer Dan Ridge, who’s now retired from active competition and spends his time embroiled in the far more challenging and fast-paced world of fatherhood to a family of 4. 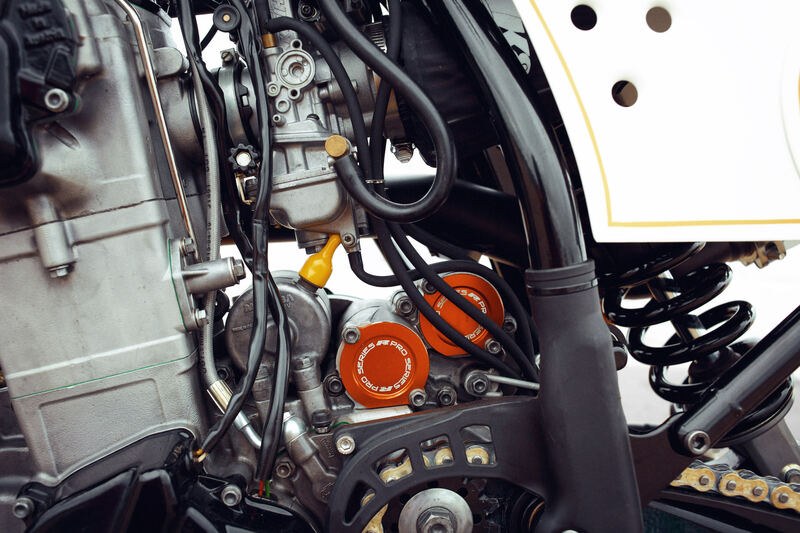 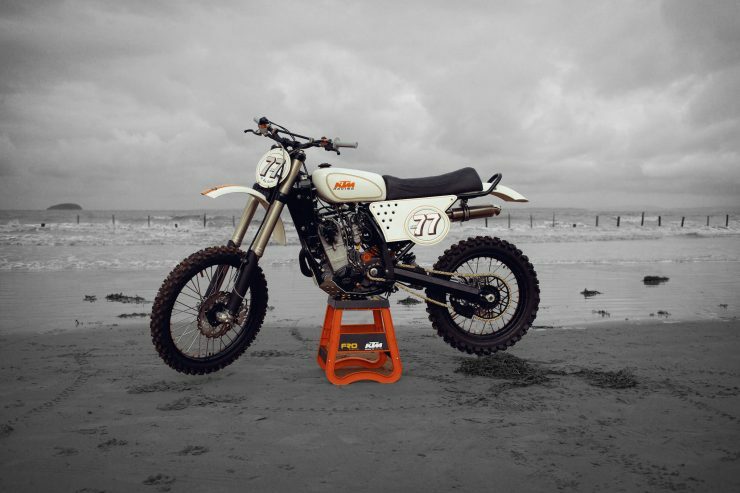 The bike started out as a bone-stock 2004 KTM 400 EXC-R – a single cylinder, four-stroke, liquid-cooled dirt bike with a 6-speed gearbox, approximately 44 hp (depending on market and spec), and a dry weight of 111 kilograms (245 lbs). 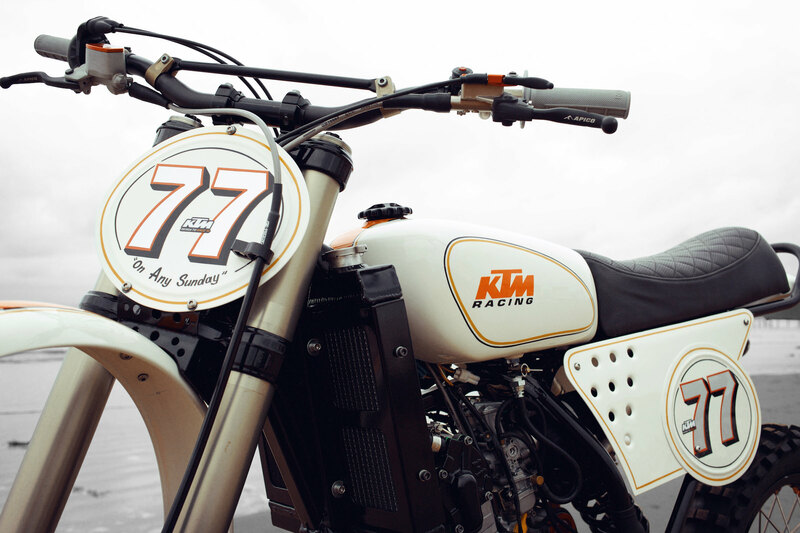 Dan wanted to turn the bike into something that referenced the iconic KTMs, Maicos, and Husqvarnas of the 1970s – with his main source of inspiration being the famous Roland Sands Design Kurt Casselli custom KTM from 2015. 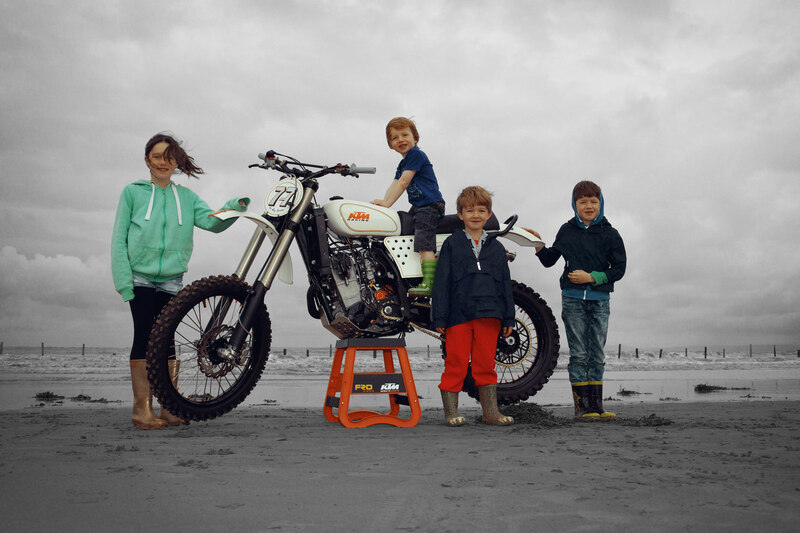 With a busy IT career and four kids the build process began in 2015 but took a full 2 years to complete. 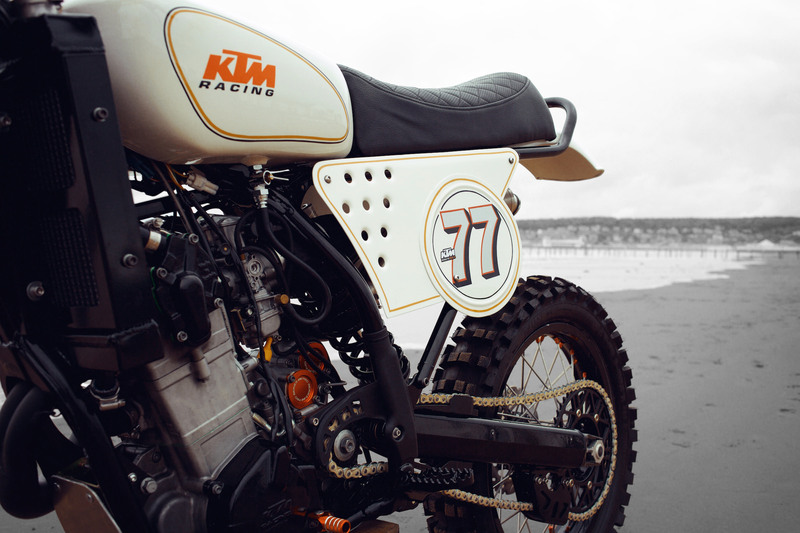 Dan’s attention to detail shines through, and as a former racer, he was careful not to compromise the functionality of the bike in any way. 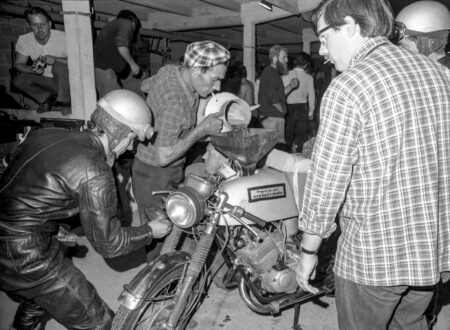 The build started as they all do – with a tear down and an inspection of the bike. 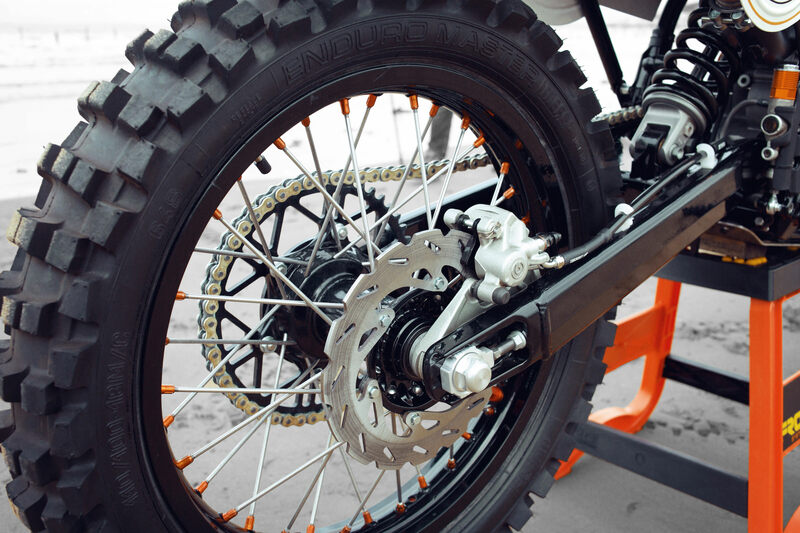 It was decided that a new fuel tank, seat, seat rail, side covers, and mud guards would be needed – with a new subframe to accommodate the new seat. 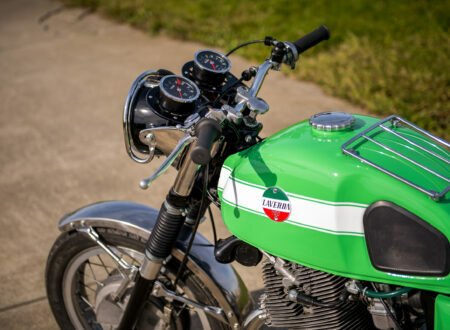 The new fuel tank was hand fabricated from aluminum, along with a new seat pan, and the front and rear fenders – which are reproductions of the ones used on a 1970s-era Husqvarna. 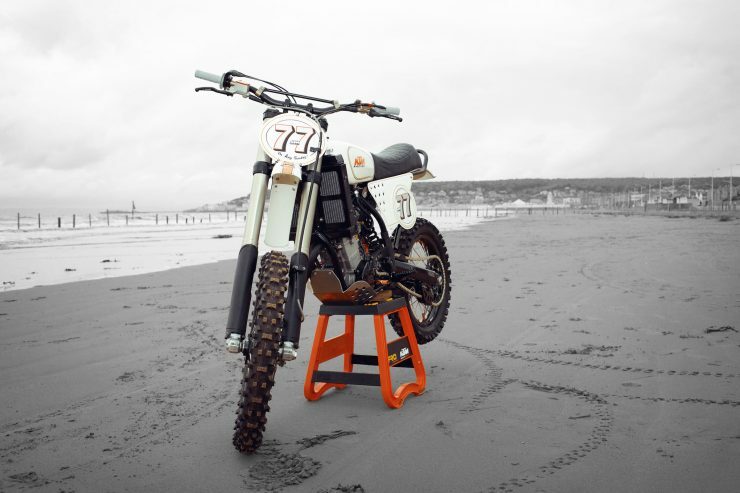 The new subframe was designed and fabricated by the team at Lumley Engineering, and the seat was upholstered using the kind of thick foam you’d typically find on a desert racer from the 1960s. 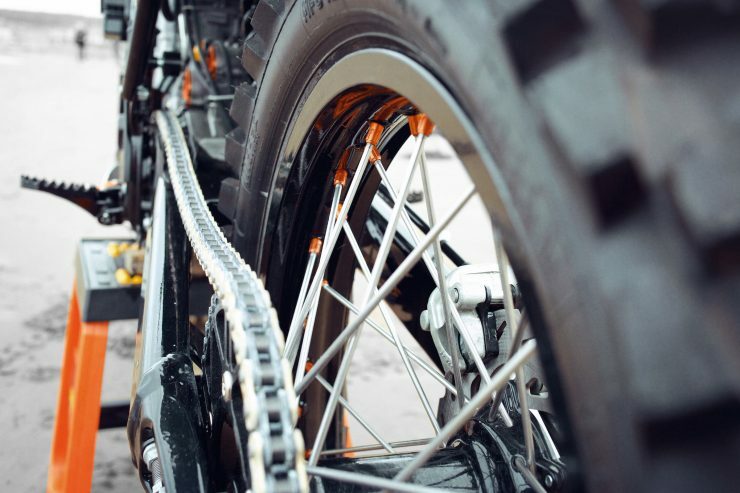 Dan rebuilt the front and rear WP suspension with all new internals, and replaced all bearings on the now 13 year old bike. The frame and subframe were powdercoated, and the front and rear Brembo brakes were comprehensively rebuilt. 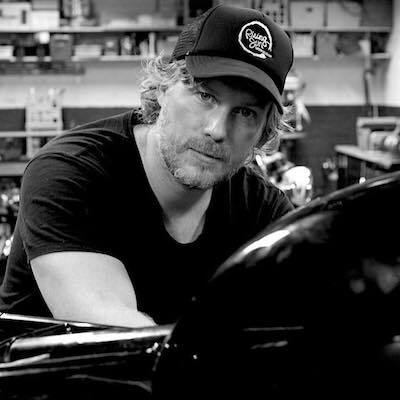 As a hat tip to his inspiration, Dan also fitted the RSD Gear Drive Black Ops Fuel Cap. In order to ensure the bike would be as quick as possible on the dirt, Dan fitted a matching set of Mefo-Sport tires front and back, before sending the bike off to JoeBys Airbrush Art for its final paintwork. 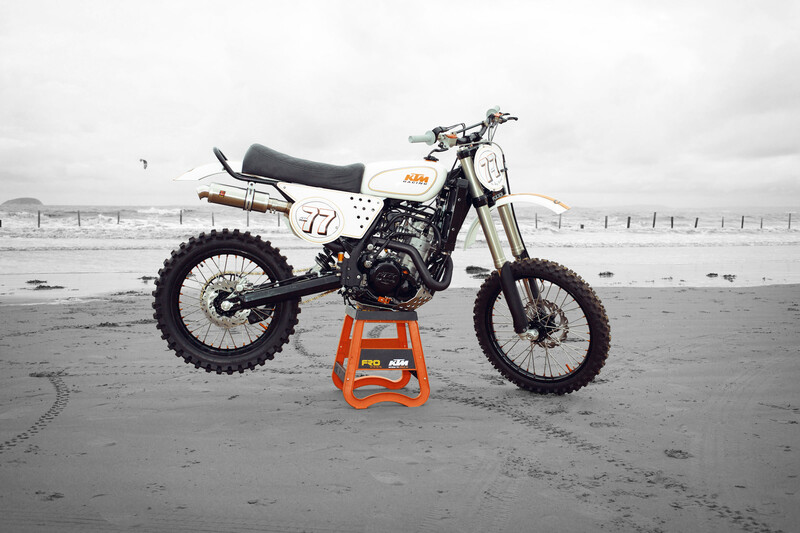 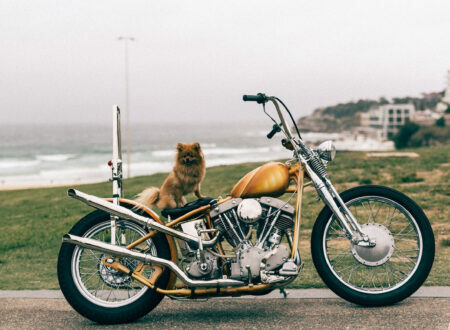 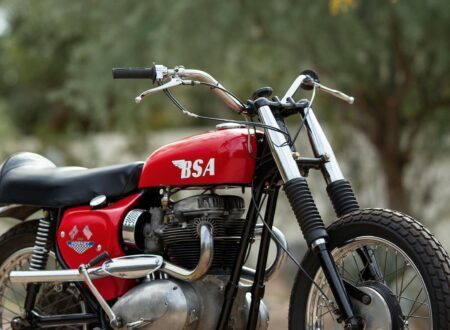 The completed bike is a faithful homage to its RSD godfather, and importantly it hasn’t lost any of the ability of the exceptional dirt bike that it started out as. 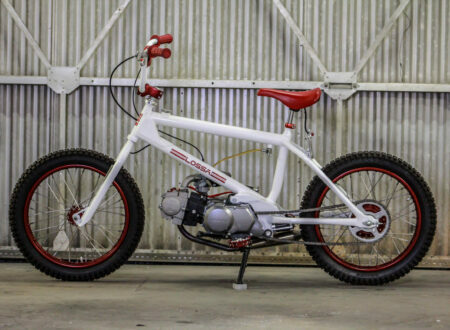 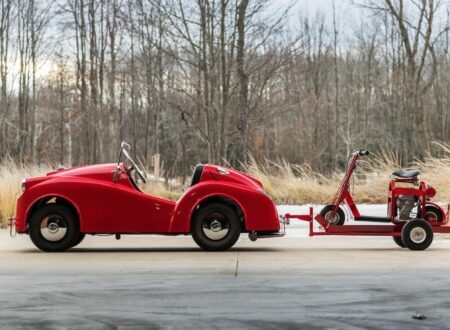 If you’d like to see more of Dan’s work you can click here – We don’t know what he has in store for his next project, but if this is his starting point it’s safe to say it’ll be an impressive build. 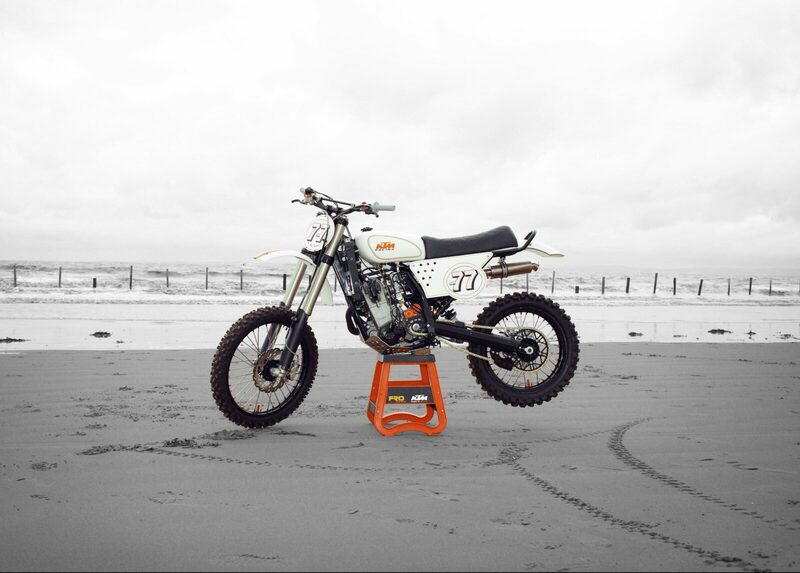 If you’d like to see the bike in person, it’ll be on show at the 2018 London Motorcycle Show between the 16th and 18th of February next year.